Liberty’s Blake Saito, front, takes on Ashland’s Jake Visintine in the first round of the OHSAA Division I Individual State Wrestling Tournament Thursday at OSU’s Schottenstein Center. Saito won 1-0 to advance. Big Walnut’s Baily Munday, left, competes against Elyria’s Joshua Breeding in the first round of the Division I Individual State Wrestling Tournament Thursday at OSU. No one in the history of high school wrestling has ever won a state championship at the district meet. That’s not to say, though, winning a district crown and nabbing the top seed that comes with it can’t offer a huge boost in the state showcase. Just ask Olentangy Liberty’s Blake Saito, Carson Kharchla and Trevor Lawson and Olentangy’s Jacob Sherman and Alexander Gore. 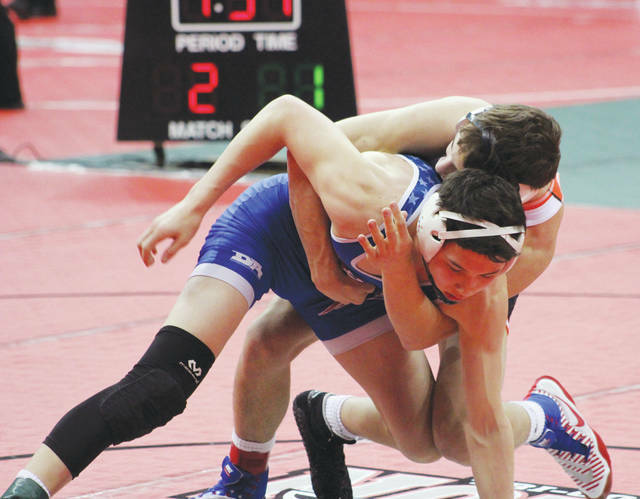 All five, fresh off district titles, won their opening-round matches at the OHSAA Division I Individual State Wrestling Tournament Thursday night at OSU’s Schottenstein Center. Saito (132), just a sophomore, outlasted Ashland junior Jake Visintine 1-0 to keep his dreams of a state title alive and well. He’ll take on Wadsworth freshman Logan Messer, a 6-4 first-round winner, in today’s championship quarterfinals. Kharchla (170) was in control of his opener from start to finish, rolling to a 15-7 win over Massillon Jackson’s Tyler Tolarchyk. The junior will take on Cincinnati Archbishop Moeller’s Sam Wyche in the quarters. Lawson (182) found himself in a scoreless match before taking control in the second period. The senior, who finished third in the state at 170 as a sophomore and second in the same weight class last year, pinned Vandalia Butler’s Jansen Love with five seconds left in the middle period to move on. He’ll take on Massillon Perry senior Zach Blackiston in the quarters. Sherman (113) doubled up Mason freshman Dominic DiTullio 4-2 to advance to today’s championship quarters. He’ll take on Brecksville-Broadview Heights senior Andrew Perelka, who rolled to a 12-4 decision in his opener. Gore (145) led 7-0 in his first-round showdown before collecting an 8-4 win over Madison’s Shayne Magda. He’ll take on Brecksville-Broadview Heights’ Victor Voinovich for the right to move into the state semifinals. Liberty senior Jordan Rosselli (126), a district runner-up, also won his opener. He beat Mason’s Dylan Waugh 5-2 and will take on Lakewood St. Edward sophomore Bryce Hepner in today’s quarterfinals. Hepner finished second in the 113-pound division at last year’s state championship. Others in action included Big Walnut’s Bailey Munday (132) and Cole Foster (138), Olentangy’s James White IV (138), Orange’s Rocco Torio (126) and Connor Evans (145) and Delaware Hayes’ Mason Sutandar (170). Munday dropped his opener against Elyria’s Joshua Breeding, a 2017 state placer, by an 11-2 margin. The senior bounced back in a big way, though. He handled Mentor’s Connor DeBoe 14-6 to advance in the consolation bracket. White IV and Evans stayed alive, too. Evans dropped his opener against 2017 state placer Michael North, a junior from Wadsworth, but beat Cincinnati Elder’s Chucky Lipps 8-5 to advance. White IV also lost his opener, but moved on in the consos with a win by default. Sutandar, Torio and Foster, meanwhile, lost both their matches to see stellar seasons come to a close. Sutandar was pinned by a defending state champ, Massillon Perry’s Emil Soehnlen, in his first-round match. Delaware Christian freshman Josh Proper, competing in Division III, was also at the showcase. He lost both of his matches, but left knowing he was the first Eagle to qualify for states in school history. Today’s Division I championship quarterfinals are slated for 11:20 a.m. with the second round of consolations to follow at 1:40 p.m. Winners will advance to the third session, which will start at 6:30 p.m. and feature the championship semifinals.